Fiji Airways Fijian 7s wing Alasio Naduva is focused on winning a spot in the Sevens Rugby World Cup in San Francisico on July 20-23 Photo: World Rugby. 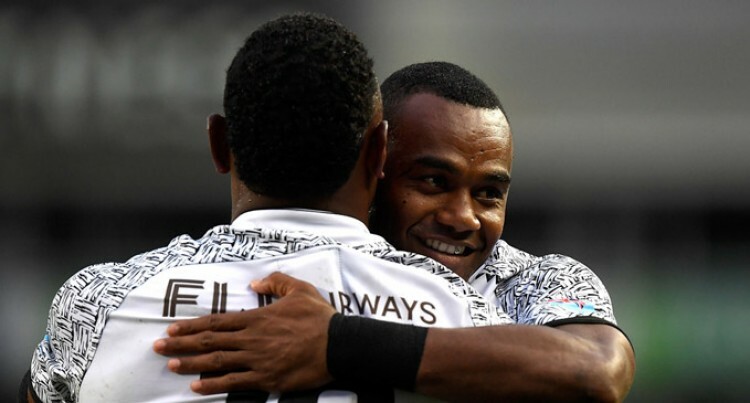 The Fiji Airways Fijian 7s wing Alasio Naduva has declined offers from overseas clubs as he focuses on the Sevens Rugby World Cup which is on July 20-23 in San Francisco. Speaking to SUNsports, the speedster confirmed that three French clubs have approached him but he has told them of his intention. “Some agents have written to me and also we had a chat with a few of them in France. I’ve told them if they are interested to wait until the Sevens Rugby World Cup is over,” he said. The three clubs, Naduva says, one of them play in the Top 14 competition while the other two are in the ProD2. The Naweni native from Cakaudrove has been one of the finds in the 2017/18 HSBC World Sevens Series. He scored a hat-trick during the Hamilton 7s Cup final against South Africa and the winning try of the Singapore 7s Cup final against Australia. “This is my debut year in the HSBC World Seven Series and I thank the Lord and the coach Gareth Baber for having faith in me,” the Suva-based soldier said. Looking back, he says, it has been a long journey and he has learned the need to be tough especially when critics are made against you. “We do handle that part well and I follow the senior players like Vatemo Ravouvou, Jerry Tuwai, Sevuloni Nasoko and Sevuloni Mocenacagi very closely. They had told me frankly when Fiji wins we are on top of the world but if we loses you’ll be thrown right to the bottom of the ocean. “We handle that well when we are criticised but at the end of the day we are representing Fiji. We always appreciate those criticisms as we try our best to make Fiji proud especially for our families and for every citizen. “When we lose we do feel ashamed and also at times we get sworn at. We ask the people of Fiji as we prepare for the Sevens Rugby World Cup to please back us up so that we can win and for the whole country to celebrate.